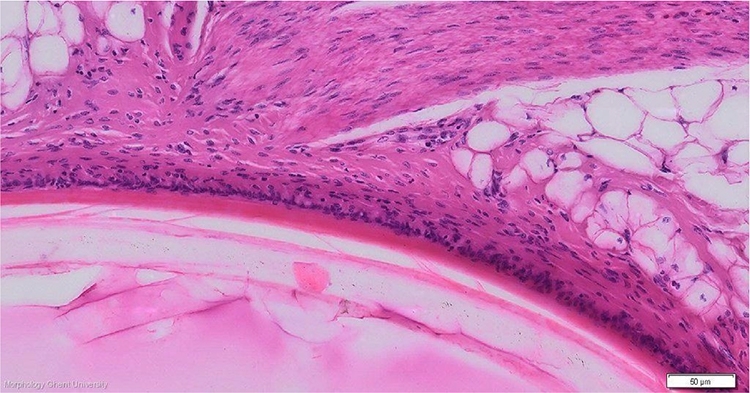 The germinative layer of the epidermis of the follicle is a regular mono-layer of low cuboidal cells, covered by a completely cornified layer. The dermis is a compact layer, twice as thick as the epidermis with especially collagen fibers but also elastic fibers (in 3 layers), into which the tendons of the feather muscles ramify. The wall of the calamus stains very pale. In between the wall of the calamus and the follicular wall, corneous connection strands can be seen.